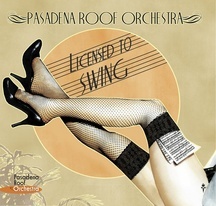 CDPRO 9 "Licensed To Swing"
The album includes eleven tunes of the Orchestra's existing music collection that hadn't been previously recorded. Amongst them, titles such as 'You're The Top', 'Jungle Nights In Harlem' or 'At The Jazz Band Ball', just to name a few. Long term fans may be pleased to hear a new recording of 'Am Sonntag Will Meine Süße Mit Mir Segeln Gehn' or 'No String' as these classics were only ever recorded by the band on vinyl. Check "Tour Dates" for live performances of the new programme "Licensed To Swing"!